How-to-sessions (interactive, theme based workshops) held on the 2nd Monday of February, March, April, September, October, November. Situated in the heart of Europe, we are proud to take our name from this green and pleasant little country. 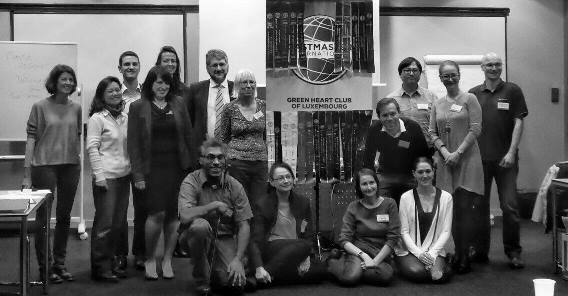 Green Heart Toastmasters Club has flourished since its creation in 1996, allowing its members to effectively speak in public whilst having fun! The Green Heart Club is proud to have over 40 members, who come from all over the world. What's more, their backgrounds, ages and professions are as varied as the palette of nationalities. The club includes native and non-native English speakers, and we welcome guests, new members and members of other clubs to enrich our meetings. Visit our next meeting - guests are most welcome! What’s a typical meeting like? The meeting is divided into three parts: prepared speeches, Table topics (impromptu speeches) and the evaluation/reporting section. Of course! Our meetings are open to everyone. You can visit us as many times as you want to see how our it works. We do not put pressure on members to join. Just check the meeting and show up at the next convenient date. I’d like to come, but I’m afraid I’d have to speak. Can I just listen? Our meetings are not only about speaking. Listening is also a valuable skill which we need to give feedback. Newcomers won’t be forced to speak if they don’t want to. If you just want to sit and listen, that’s okay! Is my English good enough to participate? Our members include many non-native speakers with varied levels of proficiency, so there’s really no need to worry. We also have native English speakers who point out common mistakes, however, always in a very positive manner. Access to a library of free online materials on the Toastmasters International website. The opportunity to set your own educational path in our club, perform speeches and complete projects in the areas of communication and leadership. The chance to take part in speech and evaluation contests at club and higher levels. The monthly Toastmaster magazine containing articles and materials about public speaking and leadership. To become a member, you pay a one-time registration fee of 50 € (25 € for students) plus 96 € in annual membership fees. If you join mid-season, you only need to pay until the end of the financial year (October to September). Before joining you can attend as a guest as often as you want, to decide whether Toastmasters is right for you. Since 1924, Toastmasters International has helped more than 4 million people, from around the world, become more confident speakers and leaders. It provides an education frame for people who are looking to improve their speaking and leadership skills, gain confidence and develop a set of communication skills that could serve in either the professional or private life. The organization has more than 352,000 memberships. Members improve their speaking and leadership skills by attending one of the 16,400 clubs in 141 countries that make up our global network of meeting locations. Toastmasters aims to give the members the skills and confidence they need to express themselves effectively in any situation. Whether you are a professional, entrepreneur, student, stay-at-home parent, or retired, Toastmasters is an efficient, enjoyable and affordable way of gaining great communication skills. If you want to know more, do not hesitate to contact us or to join one of our meetings!